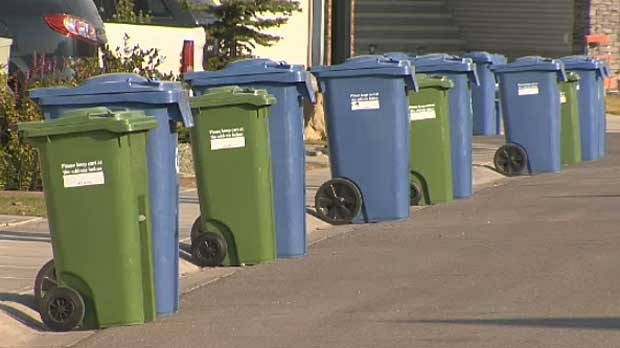 All private homes (and some apartment and condo buildings) in Calgary are given black, blue, and green bins for waste collection. If you have a back lane behind your house, your black, blue, and green bins will stay here, near your garage or parking space. The City of Calgary is responsible for picking up and emptying these bins once every 1-2 weeks, and every neighbourhood is assigned a certain day of the week that this will happen. It is your responsibility as owner or tenant of the house to make sure your bins are in good condition and are placed near the back lane behind your home, at least 60 cm apart, before 7 am on the day they will be emptied. What is a blue bin? Blue bins are the place where you put items that you want to throw away, but which can be recycled. Recycling some of your waste keeps our landfills from filling up too quickly and makes for a greener planet. To use your blue bin, just put your recyclable items directly in the bin (without putting them in a bag first). If the item previously held food or other liquid waste, rinse the container out first. To find out what day your garbage and recycling pickup will take place, use this tool. Finally, if you are confused about what you should do with an item you want to get rid of, and don’t know whether it goes in the black, blue, or green bin, you can use the City’s online tool to find out What Goes Where.